If there's one thing that I think bloggers ad business owners struggle with the most when they're starting out, it's staying on top of routine duties. You're told by so many people to do so many different things, that it's hard to know what to do. Some people say to dive right in. Some people say to work ahead. Some people say to post once a week, some say to post every day. Post on social media a million times a day. Start a podcast. Open a shop. Create an ecourse. A workbook. Write an ebook. Join all the groups. Engage with the world. But the truth is that when you're online, you get told to do all of these things in order to achieve success. If you want to post daily, go for it. If you want to post once a week, awesome. If you want to use only Instagram and Facebook, that's fine. Want to only run a blog and not create an e Course? Get on with your bad self. 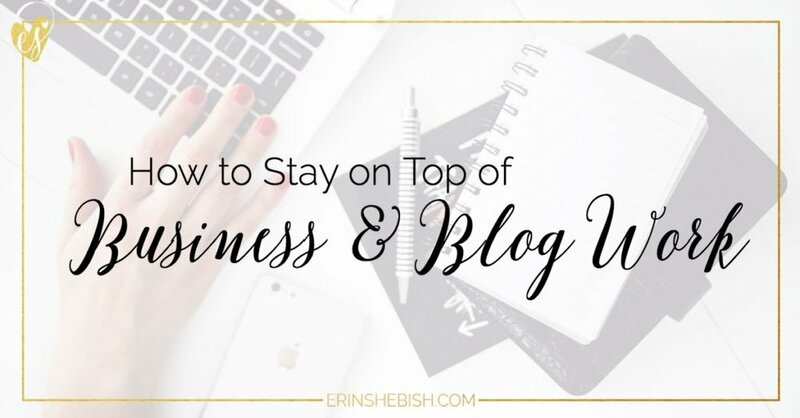 How to Stay on Top of Business and Blog Work | Staying on top of blog work and business work can seem overwhelming. Especially as a solopreneur. But you can do it a bit more easily with these tips! One of the things that I found helped me the most was to schedule time for myself to brainstorm post ideas. I'll set aside a chunk of time once a week to just put my post ideas on paper. There is no rhyme or reason to the brainstorming time, just ideas. And this goes for anything. Whether you're a blogger or a handmade business owner, you need that time to brain dump. Get everything you're thing about in your business down on paper. For a long time I was anti-calendar. I don't like feeling like I'm locked into something. But for some people, that really works for them! Instead of writing in pen on my calendar what I'm going to post, I use post it notes to arrange posts in my schedule. This allows me to really rearrange if needed. So when you're planning out product launches or blog posts, schedule. It doesn't have to be a set in stone thing but more of a guideline. If you have to rearrange, so be it. If I know what posts are coming, I'm able to sit down and really work on writing the content. I can schedule time to knock out the writing of several posts all at once. Then all I have to do is create images for the posts and that can be done during a different batch editing session.